In an old, dusty book, I once found a handwritten note about him. It said, in swirling script, that he collected fires, the fires of the hearth and the heart, the fresh gleaming fires in a maiden’s love-wounded eye, the old and heavy ancient fires of black suns and shimmering dragons, and the fires that have no names. Almost like an afterthought the writer had scribbled — with less flourish — that some said he was not a he, but a she. Perhaps that is all the understanding one needs to explain why I was stuck to that myth then like a child is stuck to candy. Was there ever anything sweeter than the promise of a quest? I was on a train, my hair bound to the back of my head like a prisoner of war. I had been riding trains like dragons for months at this point, just flotsam drifting, drifting. When you have all the time on your hands, why would you worry about getting anywhere after all, being anywhere? One place was much like any other, no matter what time I chose in my passing. I had not yet found the book in its shell of dust. The last day of winter. I make a point of marking things as Before. They are dulled by my marking them as such, but also because my eyes could only see dull, my lips only taste dull, my palms only touch dull… You get the picture. I met the tree on the last day of winter, seasons clashing in the shadows of snow and blossom like first-time gladiators. The tree was a sapling, but it was also older than anything I have ever seen, even in museums on school trips, Before. The tree talked, and while there are many trees that know speech, no tree has ever talked like this. It warned me of being caught in bark and root and leaf and told me of the shackles that were binding me, shackles of time. Don’t let that bloody cold iron weigh you down, said the tree. In all the world there is no time that can hold you, unless you let it. But most of all, beware the prison of bark and branch! For a tree, it was quite nutty. And yet, Before, I lived with time like a boat lives with the river. Now I am the river. And I can finally understand that the sapling tree of winter’s last day hadn’t always been a tree the same way the book hadn’t always been a book. I know I found it in a funeral pyre of dust. There is nothing in love with dust as much as ancient books that have some magic in their spine or a spell stuck between their pages. This book loved dust because old bones like the feel of it, loved dust because its very sight and smell recall the mood of tombs. The place was Venice, the time was that of daggers and distressed damsels, and the earth still unmovingly caught in place with the sun running around her like a puppy. The book was not hiding in a library like good little books do, no, it had crawled into a fireplace, jammed itself between two bricks, just outside the hungry reach of the licking flames almost as if it longed for the oblivion of fire. “Signora, you will smudge your gown in the ashes,” said my host to me. I had met him not by chance, because there are no such things as chance meetings; I had met him by dropping straight into his gondola as it passed beneath a bridge that would not see the turning of another century. He was a self-proclaimed magician and member of some occult order or other. In another time, men and women like him carried all the myths of their people in song and verse, not like a burden, but a feather. “Hah, ashes never leave stains on me! There is a secret to your fireplace,” I said, withdrawing the book. Just like chance meetings, secrets are an illusion, but I did not tell him that, not then, not ever after. Nothing is ever found, but met again or for the first time. The book to me felt like a childhood friend. I am back on the train, backpack on my shoulder, earplugs dangling below my collarbones. The music is coming to me like cricket song. The train stops, and I can feel it in my body, the sense of stopping, of clashing back to here. The doors open before me, and I can see the train station in all its 21st-century glory, but I take the steps back to long ago. The Romans have not even been to this here yet. Roads are easier followed by starlight than by sign or compass, and I step down into the softness of a forest that has never seen an ax. There is a sense of home, but it doesn’t linger, and as I continue walking, I forget about it. I see the fox from the corner of my eye. I follow him. He does it a couple of times, almost letting me see him, but vanishing past an oak or elm just as I snap my head around. Tricksters, I think, gotta give them points for perseverance. Finally, he lets me walk to him. He has somehow climbed a tree and is looking down at me, even though foxes are such poor climbers. “You are questing, aren’t you?” says the fox that’s not a fox. “No,” I say. I want to go. Talking to tricksters can be trouble or temptation, and I am not sure I need either right now. He laughs, long as a breeze, deep as a well. I shift the backpack to the other shoulder, am half-tempted to plug my ears with classic rock that’s nothing short of science fiction from where I am standing. “Whoa, where’d that come from?” I say, uneasiness heavy as meatloaf in my stomach. There is a rule with tricksters, just one. They always know your heart’s desire, and if they ask you what you want, you have to answer to the best of your ability. I can see the fox smiling as my mouth starts speaking. Summer in the forest, with the fox-haired girl. The fox peeled off his fox skin as soon as he had heard my answer. Don’t I like him in girlshape more than I did in foxshape, he asks with lips Cupid would probably envy if he were here. I don’t have to answer her now of course, can let the forest slip beneath me, soft as any pillow of down. “You cannot have it for yourself,” says the fox girl, tongue burning on my skin like sunshine. Have what? I want to ask, but damned be all the creatures of the underworld if ever anyone got to ask a trickster a straight question. They just twist everything until it never knew its true shape. We meet again in a field of battle. The battle has ended — was it yesterday? It smells like yesterday anyway, meat rotting, other things souring the earth, the water beneath, the wind all around. She is now a fox-haired man, warrior-strong, dirty, because he fought here when I just came as a spectator, to watch history unfolding like a tablecloth for Christmas dinner. “You cannot have it,” he says. His voice reminds me of coiling muscles beneath skin, true movement hidden by flesh and blood. I have the book in my backpack now, carry it there like homeless people carry all their life under one arm. “Cannot have what? Fire? Like you know anything about heat, you yourself are cold as darkness,” I say, and feel more than see him come at me with his short sword hissing out of its sheath. I duck and roll to one side, time isn’t really an issue for me after all, even if I’m dealing with a trickster. I pick up a sword that belonged to someone else who has no use for it anymore from a pile of gore as I get back to my feet. “How dare you call me cold? Have you not felt yourself how I burn?” He comes at me again, and this time I parry his swing, let his blade flow down my own like water. I could do this forever, I know. I wonder if he can as well, wonder if that’s what he wants, keep me there, forever bound by the clashing of our blades. “I can give you the book,” I say. He stops with his weight on his back leg, ready to come at me again, but he hesitates. He waits, still coiled and ready. “Well, the only other thing I have is the quest, and it is my quest like this sword is mine, yet not my own,” I tell him calmly. I see him collapse, from the inside out, terribly slow like a disease taking a lover to Hel. I love the trickster about as much as one thousand and one one-night stands, but I see a familiar loneliness inside him staring right back at me, and without really knowing what I’m doing, I say yes, and we both leave our swords in the mists of death. We are in London this time, the National Gallery, where ages come together and beat tambourines in all colors of joy. Fall curling in the leaves. Finding afrits was a challenge. We both knew that most of them lived in the underworld. We entered through the Orpheusway, which was easy enough, but there were some challenges on the way, which is probably to be expected when you’re on a quest. 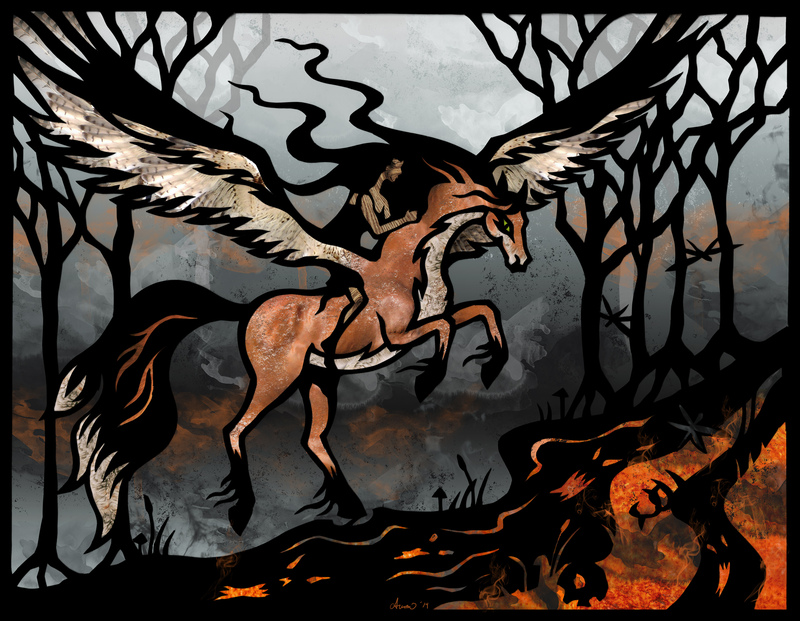 The trickster took the shape of a magnificent winged roan horse, which was incredibly helpful with crossing rivers. The book luckily contained a map of Hel, and so we found the bright palace of the afrits’ queen with a minimum of detours and challenges. The queen’s gatekeeper gave us three riddles to solve, but that’s really just silly protocol if you’ve brought a trickster along on your quest. And the afrit queen laughed and laughed, laughed until her palace shook with steam. “Oh, please, like we haven’t heard that thrice and thrice again,” said the Pegasus, ruffling his wings. “I could plant you a tree of fire,” said the queen, glancing at me. “Not very likely,” I said, cool as the rivers of all Hel. And so we came back from Hel, looking for birds. “It is really a silly quest, you know.” The trickster has taken girlshape again, but this time her hair is short. I see that she wants to curl my own long hair around her fingers, see her fingers actually twitch, but instead she hurls another fistful of breadcrumbs at the pigeons in the Piazza San Marco. I’m not sure why we picked Venice to feed pigeons. The afrit queen was not talking about pigeons, and we both know it. “It’s not like we really need this quest after all,” she says, but even as she says it she has to know that she is lying. The basilica behind her is looming in beauty, but looming still. I take her hand, lace my fingers with hers like trees will lace their roots after years of growing side by side, and I tell her that she knows she’s wrong. She is quiet, listens to the pigeons’ claws scraping on the stone and holds me tighter than time. We find his birds in winter, the snow of Russia wrapping around us like a noose. The red-furred bear walking next to me is the only thing that reminds my eyes of the meaning of color. Strangely, even his birds are white, white as cranes. “Ho!” I have to shout against the wind, and I am wondering at myself for shouting Ho! Seriously, who does that? He, too, is white, but it is a different white than the snow, the same way time is different for me than for everyone else. I have one hand on the trickster’s bear pelt, and I can feel her heart racing even through the storm and the cold. The man with the birds-that-are-not-cranes stops, turns as if he were dancing a ballet, and suddenly, all around us the cold and the snow and the wind just stop. I know what he has done, he has taken time and made it stop, a trick that I could perform as well, as easy as I can take the trickster through the flow of time with me, but I hate the feel of it, hate it like trains slowing down. Beside me, the bear grows tense, for she can feel that she has just shared in this quest, that I am the one who can really claim it. Also, I know she is afraid. “Is there a better reason to seek you?” the bear asks, something only she can ask. “Has anyone ever found you like this?” I ask. “And made you stop and turn around?” amends the bear. “No, and no. Good for you,” the birdcatcher replies. “Are you sure it’ll get you a boon?” and just then all the birds turn their eyes on us, black and unfeeling, deep as the sky, wide as the reach of their wings, and their wings know no end. Had we been human, we would have been turned to stone or salt, and for a heartbeat I fear that my skin might turn to bark, but that doesn’t happen; it is the bear at my side that reminds me of feeling and of riverflowing, and I know I make her recall the shape of girls and foxes and Pegasi. “Fire…” we say, both as one. “…to burn this shifting in me into one shape, and one shape alone,” says the bear. “…to give me back the shackles of time, forge them tight enough so that I cannot slip them ever again,” say I. And there is something white and hot and burning from the inside of me out out out to my very edges, and then there is just black. “Hey, are you okay? Miss, you just collapsed; should be glad you were walkin’ on the grass an’ not on the asphalt. Should I call an ambulance?” The guy is a bike messenger. Bike messengers don’t usually stop for anyone, do they, so am I in a dream? I have to blink a few times, I cannot see as clearly as I used to, and it takes so long to focus. No, the guy isn’t really a bike messenger and I am not dreaming. He’s just some recreational cyclist dude, complete with the tight-fitting outfit and glasses. I cannot see a sapling tree anywhere, though I am sure there was one, Before; the book is nowhere to be seen either. “Ah, no, it’s okay,” I tell the cyclist dude. “I do that sometimes, you know. It’s a medical condition, but really, nothing to worry about.” I struggle to my feet. There is a great heat there, at first, but I get used to it surprisingly quickly, just as if I’d always known it. “I am…okay,” I say, and walk away, leaving the biker behind me like a babe in a basket is left on a river. I think he is calling, perhaps cursing, after me, but I don’t hear him. I need to find the trickster. I never found my trickster, and I should have known that it would be so. She did, I think. The chains of time were forged so tight around me that there really was no slipping them, not this time. It must have been the same for the trickster with her shape, of course, but more importantly, she was once again riding time like a salmon riding the stream, not free to be whenever she liked the way she had been with me. And what are the chances of two salmon finding each other in the gurgling stream? Like all the things around me, I had but the time for one life now, one, and no more, but I had no idea how to spend it, not anymore. Had I ever thought about that when I started on this quest? Or had I just been afraid to be forever caught in a tree like all of us eventually are? One life of freedom, one true death in exchange for an eternity of staring at the sky through eyes of leaves — was that really the trade I had made, and had it really been so wise to make it? Some fires will just shed their heat for mortal creatures. Oh, I did not spend that life alone; I gathered them around me, the ones that had become wooden chests and violins, chess pieces that played themselves and enchanted doors. They did not give me much, but they gave me something, and that was enough. Sometimes while I was out collecting, I spotted a tail or a paw, an ear or a whisker. Well, I didn’t really spot them, more like guessed that they were there in the corner of my eye, but the truth of that I’ll never know. All I can do in between collecting things is take the train for as long as these aging bones allow, and get off at every stop to walk to where the nearest wood is. I look for foxes in the leaves, and pretend that I have forgotten how she warned me, forgotten that I never riddled out that she meant happiness. You cannot have it for yourself. Alexandra Seidel writes poems and stories of things born from imagination and dreams. Some of her work can be found in The Red Penny Papers, Mythic Delirium, Strange Horizons, and elsewhere. If you are so inclined you can follow Alexa on Twitter (@Alexa_Seidel). Paula Arwen Friedlander is an illustrator and graphic designer from New York who works in hand-cut paper silhouettes and collage. Her fantasy and horror illustration work has appeared in magazines such as Mythic Delirium, SageWoman, and Goblin Fruit. She has illustrated book covers such as Immigrant by Cherie Priest and The Button Bin by Mike Allen. Paula’s artwork, prints, and greeting cards are available through her website and in retail stores. This entry was posted on August 18, 2014 by Ranylt in Stories.